The Nervo board to connect all your servos and more to the Arduino Uno or Mega. 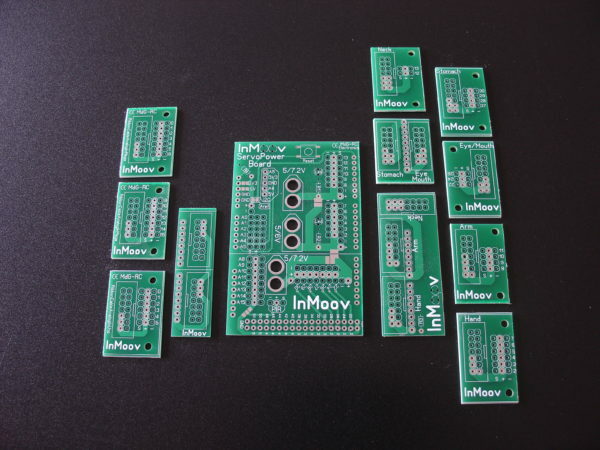 This servo board and breakout mini boards are designed to be used with InMoov, but you can use them for any kind of robotic projects that involve servos and sensors. If you want to control only the hand, the head or the whole robot, this is what you need! 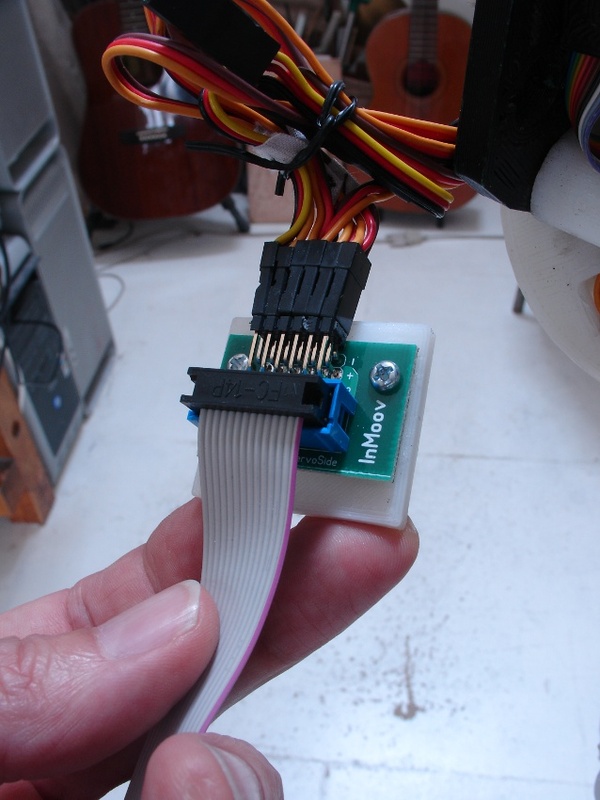 Up to 19 servos if used with a Arduino Mega. 10 sensors connections. 1 PIR sensor connection. 1 NeoPixel ring connection. Connection for i2C ready. Can be chained through RX/TX. When the parts are on backorder,it can take up to 30 days before shipping is done. The Nervo board was developed by Marten de Groot and Leon van der Horst. 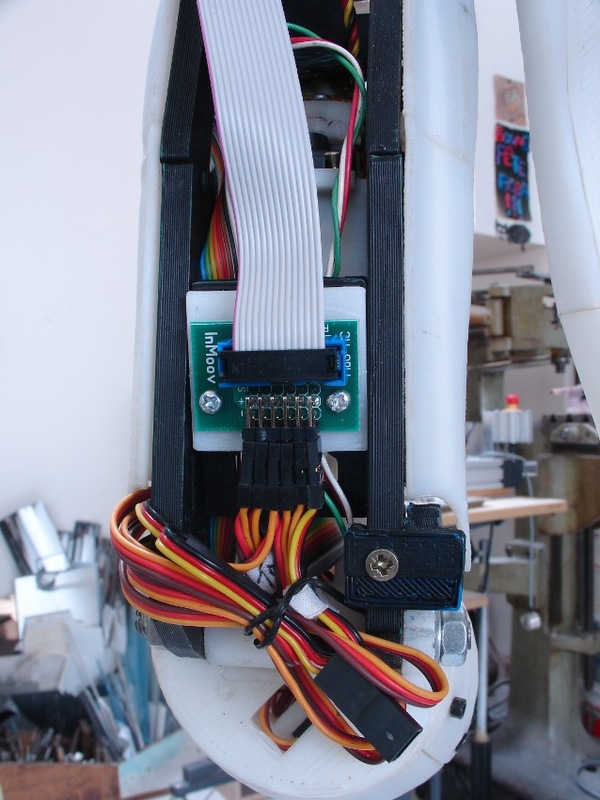 It is an Arduino-compatible shield for Uno or Mega that allows you to connect all the servos of one side of InMoov robot. If you are building the complete robot, you actually will need two of these sets. This board can also be used if you are only building the hand, or just the head. Each breakout board is dedicated with a part name. 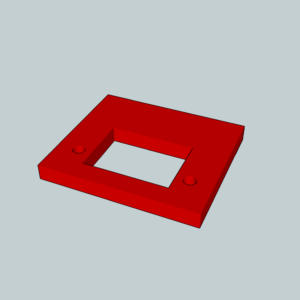 Note: These boards are cut with my CNC for now, because we haven’t found a low cost solution for small series. The set only contains: 1 shield board, 11 mini breakout boards. 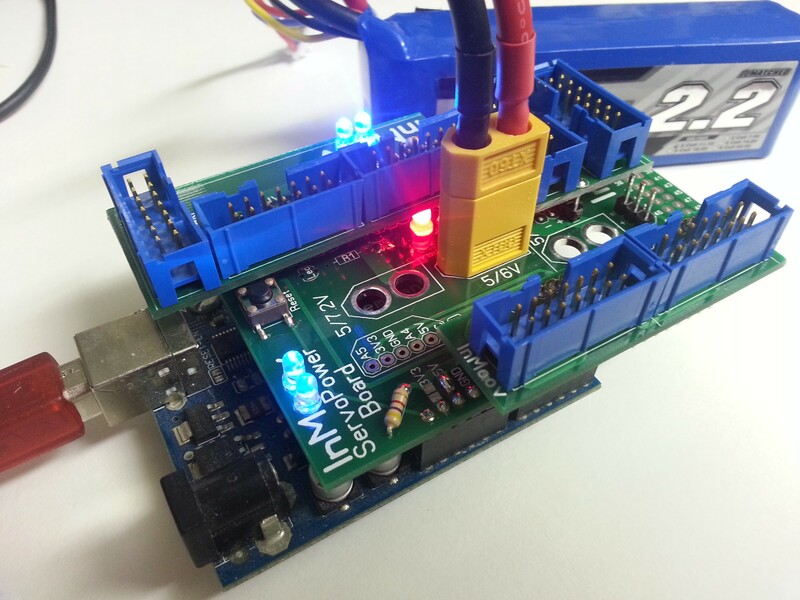 -Arduino Uno, Mega, Duelaminove…Check for similar size board specifications. Hi im new to the Inmoov project so before i decided to start making one i tried to do as much research as i could ( meaning to watch as many videos as i can ) and read all the information from this web site. When i first read about the nervo board i thought why would i need this. and then after watching the videos i occurred to me, now what would i do with all those wires going to the arduino and I used two megas so I would be ready for those legs, it reminds me of when the spaghetti exploded in the kitchen when i tried to pressure cook it (DON’T ASK ) Geil and his group were thinking when made those. They are so easy to build because ALL of the instructions are on this web site and then is makes more of a plug and play project. Shipping was fast and all of the parts came in as stated One thing, make sure you buy two sets because everybody says I will build only part of Inmoov and then end up making the whole thing Except Legs hint hint and it takes more than one set. I bet when those legs come i can use the rest on them! 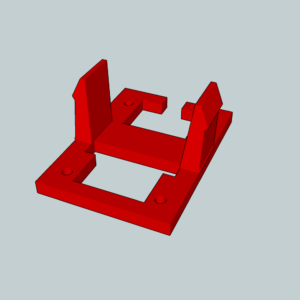 Also dont forget to get the three stl files to mount them. 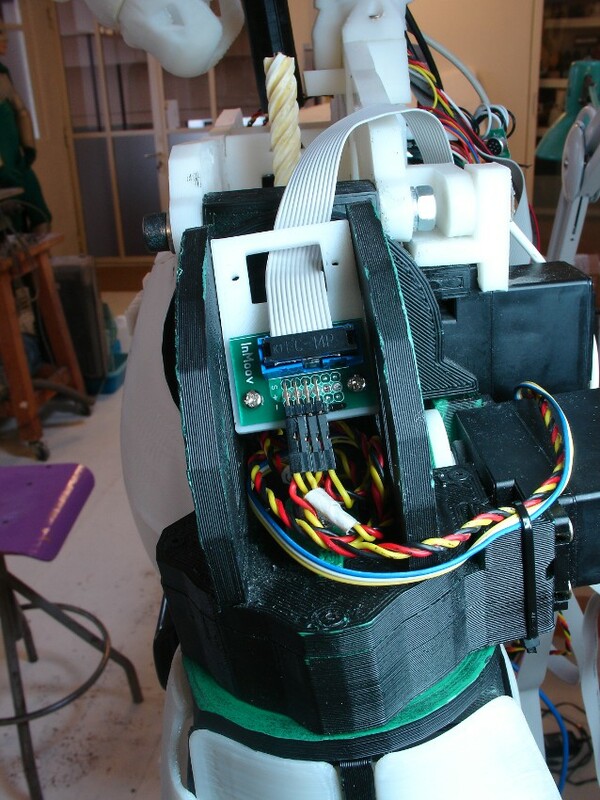 Remember its for a good cause How else can they get funding to make those legs 🙂 on a serious note they work and will help in your build of Inmoov. Buy them you can’t go wrong! At first I wanted to design my own board, but I realized that this would take to much time. The Nervo board are high quality boards. I am very happy with them (You need two sets for the inMoov). The boards came quickly and where well packed. The instruction on the website is clear enough to get you started. Hello, the store provides invoice of products ?? 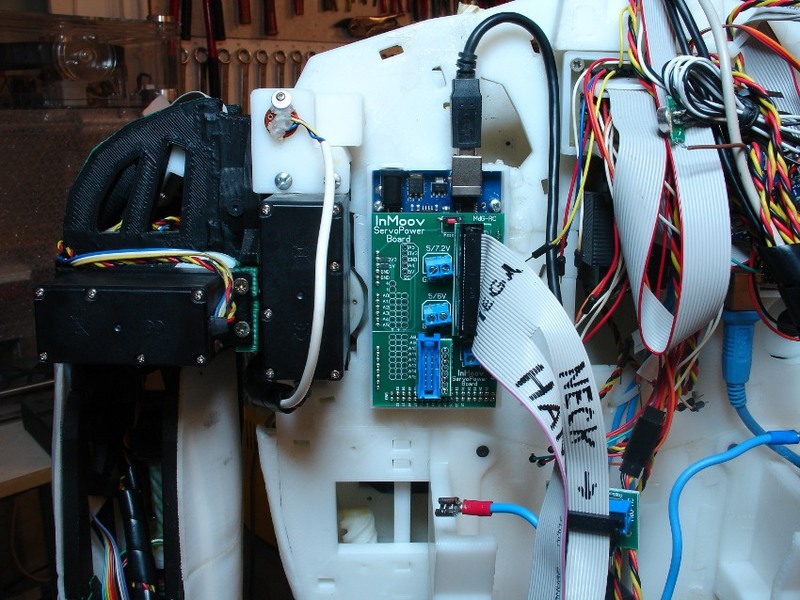 I’m building a complete InMoov and using MyRobotLab, so the logical choice is to use the Nervo rather than develop a less effective, probably more expensive solution from scratch. If you want to do your own thing, that’s fine, but it helps a whole lot to understand how something was designed and is supposed to work before you blaze your own trail. 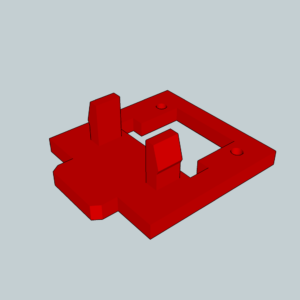 The Nervo board is part of the design and it will truly simplify the wiring and operation of your bot. 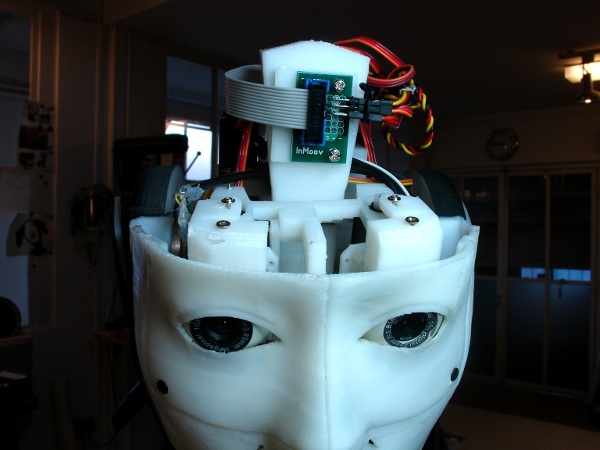 One Nervo board will handle the head, neck eyes and stomach plus one arm and hand including sensors. It looks like two Nervo boards will handle both arms and all current systems, probably including variants like the 3-axis head. Assembling the boards was a little monotonous, but not at all difficult. It took me maybe 1.5 hours. The hardest thing was probably splitting the right-angle break-away headers. Fortunately, there are few extras. Read through the instructions on the web site, lay out the boards and dry-fit the parts and then read the instructions again. Go ahead and buy some (3mm) LEDs and resistors because they look pretty cool and tell you the power is on. If you have not done a lot of circuit board soldering, there are plenty of good guides out there on YouTube and elsewhere. If you don’t already have a soldering station and are someplace that uses 110V, just order a Stahl STSSVT for about $21. I use .015″ (.38 mm) silver solder (62/36/2 from Radio Shack). .025″ is common but thinner is better. And get some desoldering wick just to be safe. I’m about to order my second Nervo board and am really looking forward to getting everything Mooving. 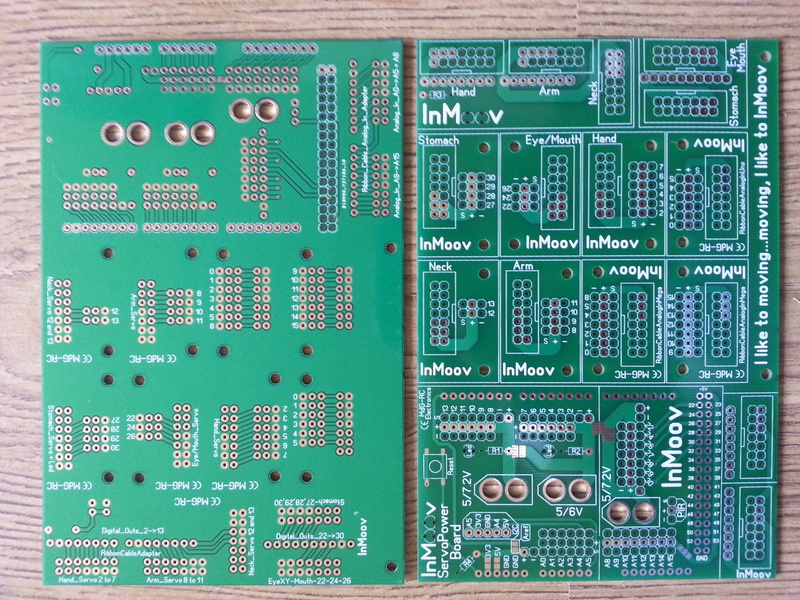 Pour faire fonctionner InMoov partiellement (coté gauche par exemple), il vous faut un kit Nervo Board. Pour faire fonctionner le robot entier, il vous faut deux kit Nervo Board. 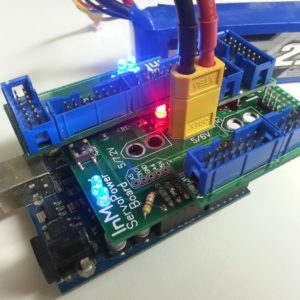 Les kits sont prévues pour montage sur carte Arduino Uno et Mega. Je n’ai pas testé sur une due mais si celle -ci est compatible cela ne devrait pas poser de souci. En fait les cartes sont en stock, mais comme je suis en deplacement, je ne peux gerer les commandes et envois, c’est pourquoi je les laisse “out of stock” jusqu’a mon retour. C’est une resistance 470 ohm qu’il faut. I have ordered your boards, any idea when it might be shipped? The boards were on back order, but I just received them. So shipping will be done tomorrow, you will receive a tracking number. I have made payment about 10 days ago, can you please tell me when the back order will be shipped out ? Components are back in stock, shipping is due for 23/11/16. You will receive a tracking number. Ok, thanks and noted. I’ll be patient :). I have already saved my tracking number, please remove it from public now. Thank you ! Hello, I want to buy 2 pcs Nervo boards for full body. But my country does not support Paypal(Turkey). I have the Credit card (Mastercard). Is there anything we can do about it? Worst scenario; I would like to ask an abroad friend buy and send. Thank you for attention. We were trying the paypal sandbox just when you tried to place your order, therefore you couldn’t pay with your credit card. Please try again, it should be okay now. You can see the map for pin connection. hello gael, i ordered 2 set of nervo board. Could you please tell me when you can ship them out? Hello, They will be shipped on monday 19/03/2018. You will receive a tracking number by email which will also include the invoice. Customer quite satisfied : the Nervo Board + components I ordered were delivered in short time. Very good product quality. Congratulations to Gael for sharing and helping about his ambitious and great project.